As a business leader in revenue, sales or customer operations you may be familiar with these situations. Last month your monthly recurring revenue was $50,000 and this month it’s only $35,000. What happened? Were there specific accounts that contributed to this shortfall? Was it a specific region? Were there too many cancellations due to customer support issues? Six months back your qualified sales pipeline was 125M and this contributed to a closed bookings of 40M this month. Do I have enough pipeline to meet my revenue goals for the rest of the year? Are there any regions or product areas where we should increase pipeline? What can I learn from sales performance of past 6 months to reach my sales goals? Why is our customer satisfaction rating declining? Looks like time to close support cases has increased over the past few months. Is this because of new products introduced? Is it because of the new support personnel we’ve hired? CEO: Why did our sales drop? Sales VP: 90% of the drop is due to two accounts stuck in renewal negotiations. CEO: What can we do to expedite it? Sales VP: We could extend their current pricing plan for another year. CEO: Let’s do that and request if they can be a customer reference for us. Sales VP: Will get this done today. Successful business leaders tend to be decisive but they can make decisions faster if they have access to underlying data and insights. SpringML’s Lighthouse product enables business users by surfacing insights based on data changes. There are two things that need to happen to understand changes. First, a system needs to first capture the data change. Then visualize those changes so that users get insights fast. Some systems track changes to fields automatically. Salesforce automatically tracks history of key fields in its “History” tables – for example, changes to amount, close date, stage are automatically tracked in the OpportunityHistory table. In addition users have the option to enable field tracking on any other standard or custom field. Such changes are stored in OpportunityFieldHistory table. Our tool can extract data from these change objects. For cases where data is not tracked within the application, SpringML offers a data snapshotting tool. This tool can connect to any application that provides web services and takes a snapshot of the “current” data on a scheduled basis. This can be daily, weekly or monthly. For example we have connectivity to systems like Workday, Netsuite, Zuora, Aria or any of the modern SaaS applications that do offer standards based connectivity using SOAP or REST. 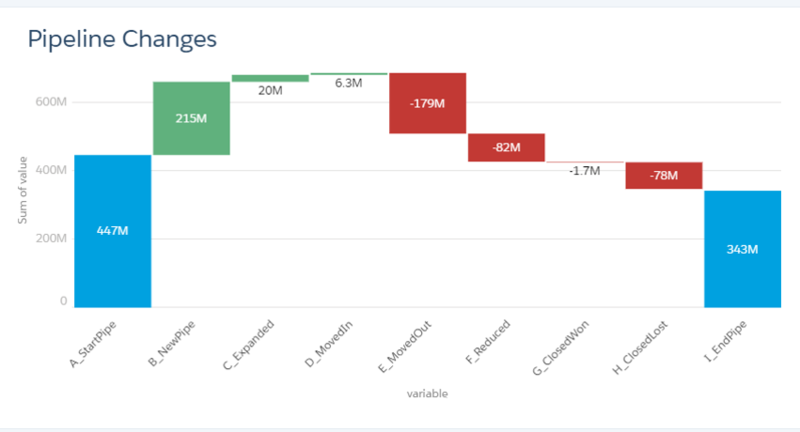 SpringML offers simple yet powerful ways to visualize changes to data. The first is a waterfall chart that shows how a metric has changed between any two dates. 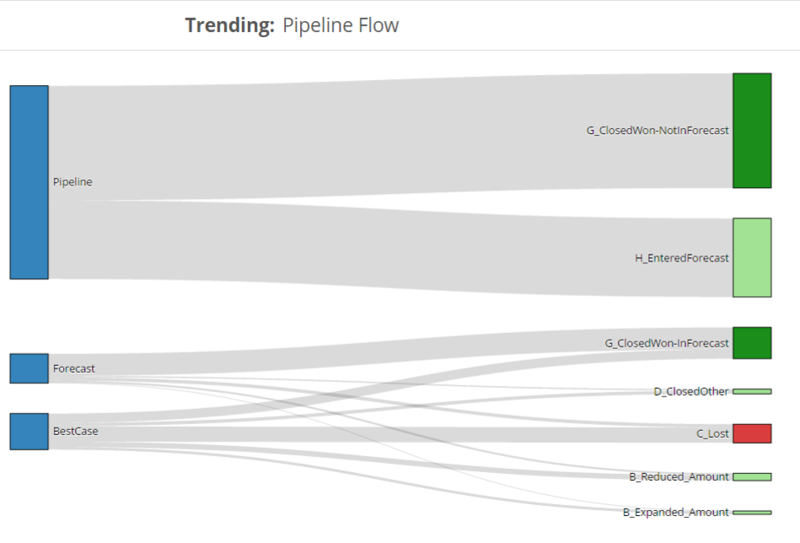 In the below chart a user can quickly see what changes happened to their pipeline over the last month. How much was won or lost, or how much of the pipeline which had a close date of this quarter got pushed out.